Flag adopted 7 April 1992, coat of arms adopted 22 May 1993. Description: A red flag with a black double-headed eagle. Use: on land, as the civil, state and war flag, at sea, as the state ensign. The flag of Albania (image, website of the Presidency), nicknamed flamur e Skënderbeut (the flag of Skanderbeg), is red with a black double-headed eagle. For Albania, PMS 485 red and black. The vertical flag has the eagle upright, i.e. not turned through 90 degrees. As depicted, the eagle occupies more of the flag than is shown above. On my monitor the eagle is approx. 29 mm high from a total width of 55 mm, and with a wingspan of 25 mm; in the protocol book, the eagle is 32 mm high out of 43 mm, with a wingspan of 28 mm. There is nothing in the book to indicate whether or not the images are exact scale drawings; presumably, having been passed by each NOC, they must at least closely resemble the real thing and its correct proportions. - 1914: Principality of Albania. The eagle has golden beak and claws and is holding golden arrows. Its heads is surmounted by a white five-pointed star. - 1920: First Republic. The flag was changed to a plain black eagle on red. - 1928: Kingdom of Albania. President (and Dictator) Ahmet Zogu proclaimed himself King Zog I. Now the eagle is surmounted by the helmet of Skanderbeg, which served as the Royal crown, in gold. - 1939: Italian occupation. Officially, Albania continued to be an "independent" Kingdom ruled by King Victor Emmanuel III of Italy. The flag was changed to plain red with the new arms of the "Kingdom", a red shield charged with the black eagle surmounted by the helmet of Skanderbeg in black, the whole surrounded by two black fasces. Beneath the shield a black scroll is charged with the motto FERT in red letters. - 1944: Provisional government formed by the Partisans. The pre-war flag was reintroduced, with a golden star added in the upper corner near the hoist, subsequantly replaced by a hammer and sickle. - 1946: People's Republic of Albania. The symbol in the canton was removed while a red five-pointed star with a golden border was set above the heads of the eagle. - 1992: Republic of Albania. The star was removed and the basic design of the flag, a black eagle on a red field, was reestablished. The current national flag of Albania is said to have been the flag of Skanderbeg, the national hero of Albania, whose helmet is shown on the State emblem. Gjergj Kastrioti Skanderbeg (c. 1403-1468) was a member of the noble Kastrioti family, considered as originating from the hamlet of Kastrat, located on the plateau of Has, in Northern Albania. Jean Kastrioti took control around 1400 of the region spreading from Tirana to Shkodër after a long struggle against the Balsha and Thopia families. Defeated in 1422 by the Ottoman Sultan Murad II (1404-1451, Sultan in 1421), Jean Kastrioti had to give him his son Gjergj as an hostage. Military trained in Adrianople, Gjergj was such a good fighter that the Turks nicknamed him Iskander (Alexander). The Sultan appointed him sandjak-bey, that is reponsible of a military fief (timar) in his birth region, and then vali of the vilayet of Krujê. Murad's policy was to appoint beys of Albanian origin to control Albania and increase his local support. In 1442, a Polish-Hungarian coalition attacked the western border of the Ottoman Empire; Skanderbeg took advantage of the confusion to seize the fortress of Krujê and organized the Albanian resistance to the Turks. On 28 November 1443, he proclaimed the Free Principality of Albania and raised the red flag with the black double-headed eagle, which was his family's standard. In 1444, Skanderbeg was appointed supreme chief by Albanian chiefs gathered in Lezha, then a Venitian possession. Skanderbeg gained the support, mostly nominal, of the Republic of Venice and also of King Alphonse of Naples, who saw him as the advanced defender of Southern Italy against the Ottomans. Moving from village to village, Skanderbeg increased his army and defeated the Ottomans for the first time in June 1444 and twice again in 1445 and 1446. Skanderbeg challenged the local rule of Venice, which attacked him in 1447. A huge Ottoman army besieged Krujê in August 1450 but withdrew one month and a half later after several failed assaults. Skanderbeg became famous in Europe as the pioneer of the Christian reconquest against the Ottomans. When attempting to transform the League of Lezhë into a unified and organized state, Skanderbeg was abandoned by two great Albanian families and betrayed by his own nephew, Hamza Kastrioti, who joined the Sultan. After the fall of Constantinople in 1453, the Ottomans resumed their attacks against Albania. On 7 September 1457, Skanderbeg won the battle of Albulene, near Krujê, and the Congress of Mantova proposed him the leadership of an anti-Ottoman crusade. A third siege set up by the Ottomans in 1467 was not more successful. Skanderbeg died from fever in Lezhë on 17 January 1468 and was buried there in the St. Nicholas cathedral. The Albanians did not give up but the Ottomans eventually seized Krujê on 16 June 1478 and a few years later most Albanian town. After the fall of Lezhë, the Ottomans desecrated Skanderbeg's tomb, spread away his bones and transformed the cathedral into a mosque. In 1501, Skanderbeg's grandson landed near Lezhë but was expelled by the Ottomans. In 1968, the 500th anniversary of the death of the national hero was commemorated with the erection of an equestrian statue portraying him on the main square of Tirana, Skanderbeg Square. The statue was made by the sculptor Odhise Paskali, assisted by Andrea Mano and Janaq Paço. Marin Barleti (1450/1460-1512/1513), who exiled to Rome in 1479 after the fall of Shkodër, published c. 1508-1510 in Latin his History of the actions of Scanderbeg, Prince of the Epirotes, which was translated in several languages, spreading Skanderbeg's epos all over Europe. Frang Bardhi (1606-1643) published in 1636, also in Latin, his Scanderbeg, whose main goal was to refute the alleged Slavic origin of Skanderbeg (a theory still defended by Macedonian and Serbian nationalists). In order to prove that Skanderbeg did not belong to the Marnavić lineage, Bardhi quoted Barleti, who had written that Skanderbeg's family emblem is "a double-headed eagle on a red background", an emblem never used by the Marnavić. It is usually admitted that the eagle is of Byzantine origin. Petit Larousse Illustré 2004 claims that the Albanian eagle is of Austro-Hungarian origin, which is simply an anachronism. The flag section of that Larousse release is marred by mistakes and can, unfortunately, not be considered as a reliable source. The eagle of the flag has often be related to the local name of Albania, Shqipëria, and of the Albanians, Shqiptar, formed on the Albanian root shqipe, the "eagle". Albania is often nicknamed the "Land of the Eagles". The eagle was indeed highly estimated in Albania in very ancient times: Pyrrhus (316/318-272 BC), King of Epirus, was nicknamed "The Eagle". However, the word shqiptar appeared only around 1555, in the oldest known documents written in Albanian, and only to designate the language spoken in the region then called Arbër. The Greek geographer Claudius Ptolemy (c. 90- c. 168) listed on his maps the town of Albanopolis, the capital of the Albanoï. In the 9th-11th centuries, the Byzantine chroniclers used the names of Albanoi and Arbanites. In the Middle Ages, the Albanians called themselves Arben, Arbër or Arbëreshë their neighbours called them Arbanitoï, Arbanensis, or Arvanites, after the region of Arbanon, near Kruja, later called for long Arbeni. There is still near Tirana a village called Arbanë and the inhabitants of the region of Saranda call their region Arbër. For the Byzantines, the Arbanites were Roman Catholic, whereas the Orthodox were called Gracci, and later Epirotes. The use of "Albanian" for a nationality appeared only in the 14th century. The seal of the Republic of Albania [image] presents a red shield with a black, two-headed eagle in the center. At the top of the shield, in gold color, is the helmet of Skanderbeg. The form and dimensions of the national symbols, the content of the text of the national anthem, and their use shall be regulated by law. The national symbols (flag, emblem and anthem) of Albania are prescribed by Law No. 8,926 (Për formën dhe përmasat e flamurit kombëtar, përmbjtjen e himnit kombëtar, formën dhe përmasat e stemës së Republikës të Shqipërisë dhe mpënyrën e përdorimit të tyre, text), adopted on 22 July 2002 and proclaimed by Presidential Decree No. 3,417 of 31 July 2002. 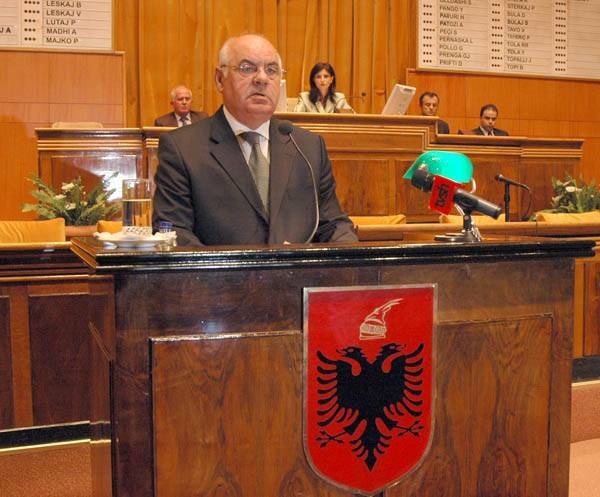 The State emblem of Albania (photo, Albanian Parliament) is a red shield, with the black double-headed eagle surmounted by the helmet of Skanderbeg. The helmet of Skanderbeg already appeared on Albanian flags during the monarchic period. The current seal is very close to the former Royal standard. The fortress of Krujë houses the Skanderbeg Museum, designed by the architects Pranvera Hoxha and Piro Vaso and inaugurated in 1988. It shows a replica of the hero's sword and helmet, whose originals are kept in the Muesuem of Fine Arts in Vienna. Sometimes described as "Viking", the helmet of Skanderbeg is indeed surmounted by a goat's head. The origin of this odd decoration dates back to the second siege of Krujë by the Ottomans, when Skanderbeg and his troops were besieged in the fortress. With no way out, Skanderbeg played a trick on the Turks. That night he and his men let out a flock of goats through the only available passageway. They placed candles on the horns of the goats, and the Turks seeing these and thinking it was the army, attacked but became confused. In the confusion, Skanderbeg was able to get the upper hand and run the Turks out. When Ahmet Zogu proclaimed himself King of Albania, he took the title of King Zogu Skanderbeg III and used the helmet of Skanderbeg as the Royal crown; the helmet was added to the flag and arms of the Kingdom. During the Italian rule, the helmet was kept on the flag. During the Second World War, the 21st Division of the SS was called Waffen-Gebirgs-Division der SS "Skanderbeg" (albanische Nr. 1). The goat-head helmet worn by Skanderbeg was also adopted as the symbol for the division's collar patch, although this saw no or only limited use (Axis History website). The helmet was then dropped until the fall of Communism, when it was eventually reinstated on the national emblem. President of Albania, Bujar Nishani has announced today the new presidential logo and flag, in the framework of the symbols of the Institution of the President of the Republic and the medals and decorations of honor that are given by him. Nishani approved the works of author Ylli Beqiri: the flag, the logo and the "Mother Teresa" Medal (images, website of the Presidency). The flag of the institution of the President of Republic is based on the colors of the national flag (the red background and black eagle) and golden color was added, as a symbol of power, prosperity and endurance. The decorating symbols of the flag consist on the black eagle, taken from the insignia of Kastrioti family, accepting it as one of the most ancient symbols used by Albanian leaders, the helmet of Skanderbeg (golden), positioned in a straight position (neither left, nor right), symbolizing impartiality and determination in the representation of national unity, and also the oak leaves (golden) which represent long life, strength and dignity, also taken as a symbol of ancient times used by king Gent of Ilyrs. The former flag of the President of Albania was a square version of the national flag. The flag used during the Communist period was similar, with a red star with a yellow border placed above the eagle. The 20th of November 2012 marks the 100th anniversary of Albania's independence from the Ottomans. In Tirana, there were regular Albanian flags everywhere, but also special flags, which are publicity items used as flags on flagstaffs and waved by enthusiasts, posted on balconies, etc. The symbol is a stylized Albanian double-headed eagle and the writing means "100 Years of Independence".